Or so I thought. Way to go me for deciding I could manage one more. A pretty piece of lace knit on the bias out of my own handspun, and I run out of yarn in the last 6 decrease rows. Look up on the left hand corner, this is the sad little piece of handspun in a different color I spun up to finish off the scarf. I had intended to dye that little corner with some turquoise dye I had sitting around the house. Trouble is, I forgot that I used all my turquoise dye. So, hopefully Sandy will be able to give me a hand in dyeing that last corner. This will not happen until the new year though, so I guess I cannot claim to have one last finished object after all. Next project up? Another KAL with Ummeyusuf. We will be attempting to knit Kelmscott cardigan in the upcoming month or so. I grabbed some Berroco ultra alpaca for mine, in a lovely tweedy gray that has shades of lavender in it. I believe I will reverse the reverse stockinette in this one, since I don’t like my purling on the outside of my garments. I’ve taken the snowed in holiday and used it as an attempt to get my outstanding projects finished. I think I’ve done pretty well, though it has left me with precious little mindless knitting. 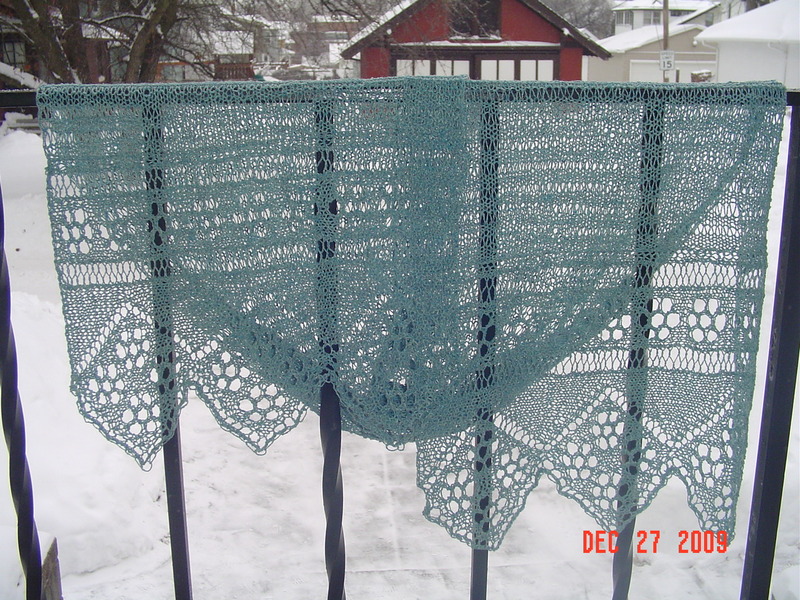 Yesterday I finished a lace scarf from Victorian Lace Today. This was done in Habu Textiles Tsumugi Silk. This is the suggested yarn for the scarf, and since it only took one cone, I have another cone to do another scarf. I love the very wide open flowers on the wide border, it complements the rather bumpy silk well. We are continuing to dig out and are going to attempt to actually leave the driveway today. I am hoping a snowplow does not go through while my neighbor is at work, this would cause yet another 3 feet of snow to be pushed into my driveway. When she comes home, her car will protect the piles and I shouldn’t have such a mess on my hands. We are again snowed in. Not that it is such a bad thing, I don’t mind a bit. If it wasn’t for the shoveling. The drifts in the back yard are over Bug’s head. The drifts in my driveway are 3 feet tall. When we aren’t talking drifting, the actual amount in my driveway is about 2 feet. Considering we still have the snow from 2 weeks ago, there really is nowhere to put this mess. I dug out quite a bit today, it took a long time. I am not done, but it was all I could handle in one day. Bug is enjoying her new snow suit which J got her for Christmas. I am also enjoying it, since it means she is outside playing while I am shoveling. 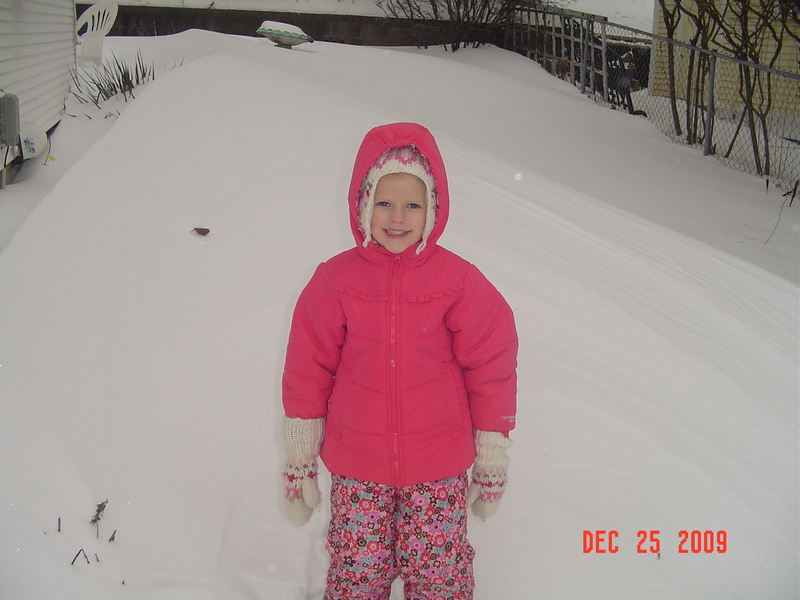 And she doesn’t even complain about being cold anymore. She is thrilled that she can walk up the drift at the back of the house and just pull icicles off the roof. She then arranges them in patterns in the drifts, her own personal ice sculpture. Bug had a very nice Christmas this year. On a whim I asked my parents to get her a marble chute. I was thinking one like my brother had when I was a kid, but what they sent was far beyond anything I imagined. She keeps saying “I LOVE this gift! This is AWESOME! 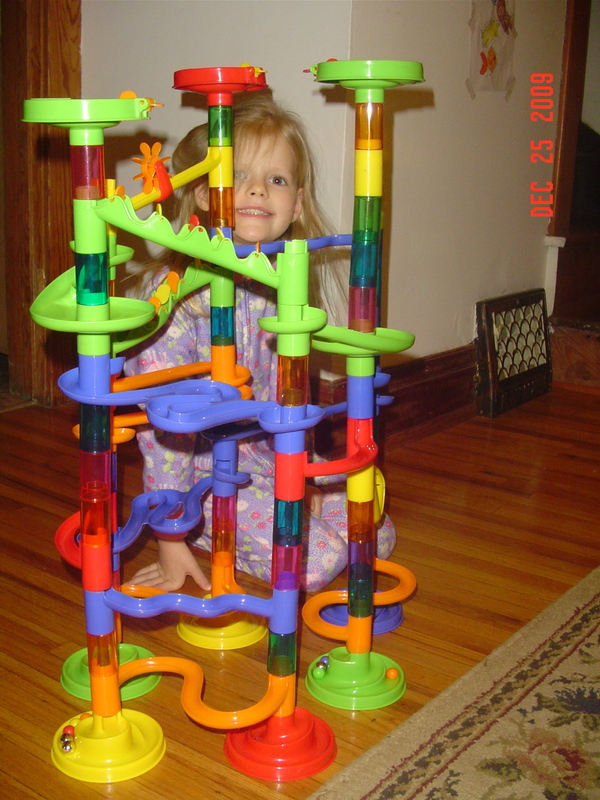 I just LOVE this gift!” After building a couple of her own marble towers, she finally convinced me to build the one shown on the box. She wasn’t even able to eat lunch for playing with this thing. It is kind of awesome, I must admit! Yesterday I finished the knitting portion of my Lady Eleanor entrelac stole. I blocked it before I even went to bed and was so proud that I had completed it. Only to figure out the next day that I hadn’t exactly followed the directions. I had a bit more to do. So I crocheted the edging and then got down to business on the intense fringe. I had NO idea that this fringe would take me all day long. But it was worth it don’t you think? It was done on Tuesday but took two days to dry fully. I couldn’t be happier. 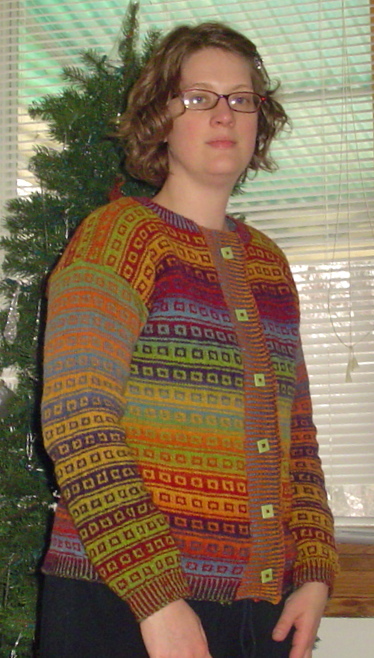 I love the fit, I love the length, the sleeves are long, it is colorful, and I like my square buttons. Bug took my picture, I need to start standing her on a chair when she snaps a shot so it looks a bit more straight on. In other news, we are basically snowed in again. Or we will be by tonight. Happy Christmas everyone, take some time to get “snowed in” with your loved ones this season. In order for there to not be silence or static on this blog, I am going to embarrass myself a little by telling you about my latest yarn destash experience. I often purchase my yarn from fellow knitters looking to get rid of something at a discounted price. This makes me feel like I am getting a “deal” while also recycling old unused yarn to a new home. The deals can be anywhere from under retail price by a buck per skein to major price cutting on my most favorite yarns. There are a few problems with this method but it has worked very well for me over the last two years, and I’ve often gotten rid of leftover skeins or unwanted yarn this way too. I think the major problems with this are threefold. One cannot be overly choosy in the color department, one never knows in what condition the yarn will actually arrive, (I’ve seen yarn already balled up, having been knit into swatches and frogged again, though this is usually stated pre sale) and one does not often know the person she is purchasing from. So I suppose the opportunity for fraud is out there. On the other hand, it had not happened to me, and using paypal does lend a level of comfort to the transaction. So, earlier this month I happened upon an amazing destash. Yarn for just a fraction of its original cost. Though there should have been warning bells, it was just too good to pass up! So, after giving it far too little thought and consideration, I spent my paypal balance (approximately $150) on a load of yarn that would have originally been more like $600. I actually thought I’d be able to turn a profit on the yarn. I then did something even worse than considering the purchase for like, a nanosecond….I got in touch with my friends, and let them know about this amazing destash. One of them was determined to purchase yarn from this destash as well, and after about a day of trying to get in touch with the seller, was successful. We then began to worry over this yarn, as the photos were stock photos and the seller hadn’t been a particularly active member of the knitting community. So we began to do a little online research. We managed to find an old blog of hers, as well as some other information, including a home address. This lead us to believe she was actually a real person and she might truly intend to send us the yarn in question. Collectively we began to wait. And get concerned as our questions to her went unanswered. After a time my friend even managed to find her husbands work email and address. It is amazing how much info is on the internet, if one has the means and reasons to find it. We set a date to give her to hope the yarn arrived and we continued to wait. I, having been vocal about the purchase, began to get messages from other purchasers who had felt stung, asking if I had received my yarn. It seemed that all of us were out our money and our yarn. We began to keep a list of everyone who was involved. After a way more than reasonable time frame, we made the decision to file paypal claims. These were immediately escalated because paypal told us that they could not get in contact with the seller. And then we decided to use our final weapon, which was the husbands email address. He did confirm that he was the husband of the seller and while he knew she had sold yarn, he wasn’t aware that people had not received yarn. I won’t even get into the various excuses that were made by this woman as to why she did not send it out, it was quite drama worthy, and I have become somewhat of a cynic in the “personal problems” realm. I now don’t even believe that she had the yarn in the first place. At least not as much as she sold. After a couple weeks of communications with the husband we concluded that nothing was to be gained there, and had no choice but to wait for paypal to settle our claim. I am so happy to note that paypal settled in our favor and has issued a refund. I’ve already received mine. And while I have heard of paypal incidents where the seller has removed their funds from their bank account and paypal has ruled in the buyers favor, the funds then could not be returned, it did not happen to us. I am convinced that the sheer number of people filing claims at once put some sort of hold on her account entirely and she was not able to move the funds had she tried to. I’ve been so embarrassed over this incident. I like to think myself a savvy internet user for the most part, questioning most everything I read here. Had I not been so greedy and yarn crazed I’d have thought about the purchase and why it might not have been a wise idea. (I also blame the time frame, it was pre coffee and about 5:00 AM when I purchased the yarn). But, I did it, even ignored my instincts to do it. The only reason this has a resolution is because of paypal, my own stupidity not withstanding. Unfortunately, this has made me a bit more careful of destashes in general, I now feel like I’d rather pay the yarn shop price than go through something like this a second time. It just doesn’t seem worth the deal I might get. If all goes well this weekend and next week I should have not one but two finished objects to brag about next week. I am at a stopping point on the kauni sweater because I need buttons, and that won’t happen until Monday. Once I have chosen buttons I will be able to finish the second button band and have a lovely sweater that needs blocking. I’ve even woven in the ends already. 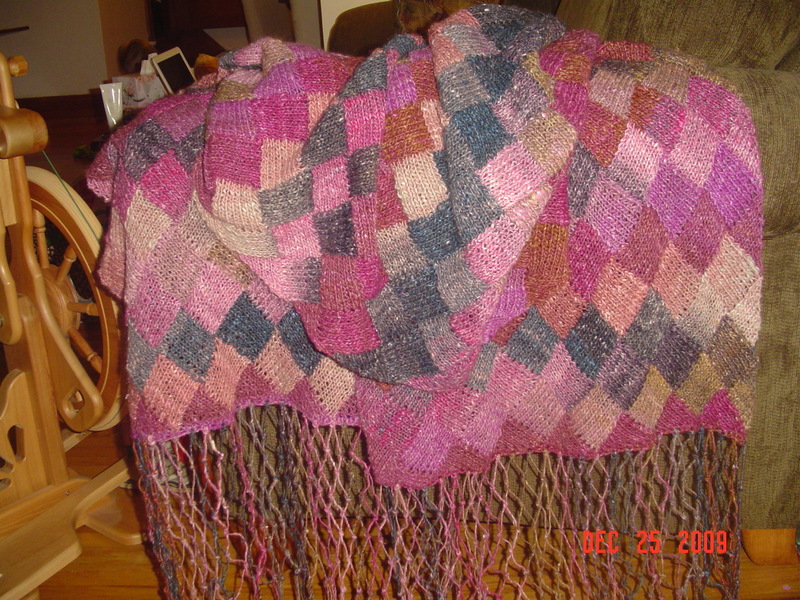 Then there is the Noro Silk Garden entrelac stole. I have already saved out the yarn for the fringe and will just now knit until I have no yarn left. This means only about 400 yards more of worsted weight yarn. This will be my weekend project. I am almost afraid that they will both be done at the same time and I won’t have enough space to block them both at the same time! But it will be nice to have a couple of larger finished objects again. What was asked of me…. 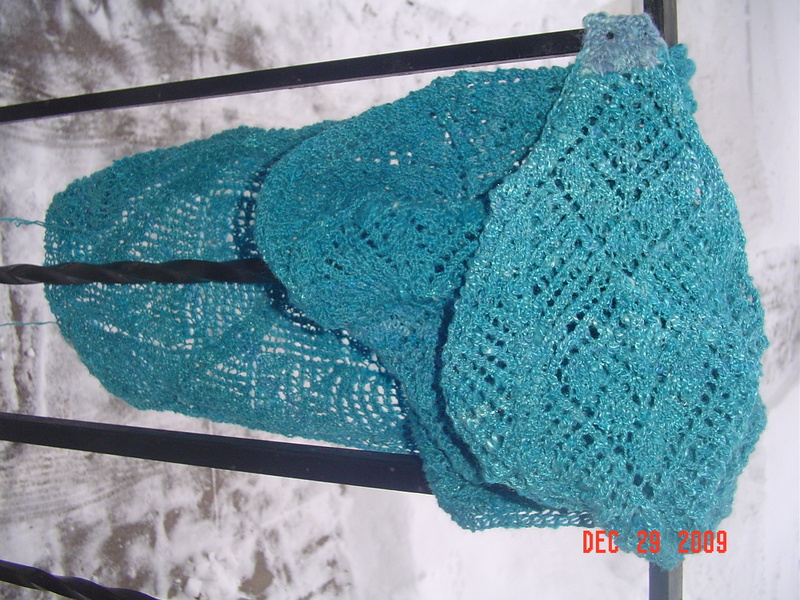 It is not unusual for a knitter to get asked frequently for a handknit item of some sort. Much to the consternation and disdain of knitters everywhere, those people who ask often do not appreciate the time, money, and effort that goes into knitting. We are asked for our time that could much better be spent knitting for ourselves or our family. I don’t often knit for people who ask, rather state my fair price and require the person asking to cover the cost of yarn as well. I do knit on commission from time to time, but often my fair price and the cost of yarn is way more than most people are willing to pay. On the other hand, knitting for other people gives me great joy, it just has to be something of my own choosing. So, when I was approached yesterday by a relative hoping I’d knit one of the colorwork stockings for his child, my immediate inner reaction was a mixture of “No friggin’ way, I’ve already knit 5” and “yeah, if you’ll pay my fair price.” But, I held my tongue initially and listened to him speak while I thought it over. Sometimes this is hard to do on such a hot button issue for knitters. But he was so humble in his asking, and had really thought it through before he asked. He expressed that the rest of the family already has handknit stockings done by Aunt Madeline, and treasured yearly. Of course this hit my heart hard because our stockings in our family are knit by Aunt Madeline and are extremely treasured. I absolutely loved our stockings growing up and I never forgot who made them as I grew into my teen years. They were big, roomy, and beautiful to me! This then brought me to thinking about the number of years those stockings have been appreciated, and the number of years they have been taken out and hung up. It makes me think about the number of years certain hand knit items last, in the case of our family stockings, long past Aunt Madeline. Which means that every year we take out those stockings we think of her and the time and effort she put into them to create them for us. Unselfishly, as a gift to the family. And wouldn’t it be nice if I could think past my own selfish knitting to be thought of the same way for years to come? This is when I decided that this child would have a hand knit stocking just as I had made for my brother and his wife, and just as I intend to make them for my brother’s children. So, in the spirit of Aunt Madeline, I’ll be knitting at least one more stocking for 2010 Christmas. And we will just have to see what the year brings, we will see if there will be new children to knit for and new traditions to be carried on. Because that is just how family works, and that is beautiful to me.